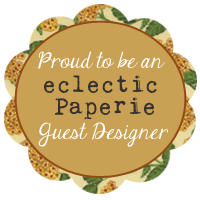 Eclectic Paperie: Song of Glory! Guest DT MIYAKE here again! I wanted a snow effect. This is just OUTSTANDING! LOVE every single detail, Miyake! And it glows in the dark, too! Amazing creation! I love ur details and imagination!!! That is stunning. Love the way it looks when glowing. Gorgeous. What a terrific project.... love it!